Donor advised funds are a charitable giving conduit where an individual, family, or corporation makes an irrevocable, tax-deductible contribution of personal assets to a charity and the donor can recommend how that charity distributes the funds to qualified charitable organizations. If certain causes are of great importance to you personally, and if you want to confine your funds to the charitable causes that you care deeply about, a DAF may be right for you. Anyone can make a contribution to your fund to mark a special occasion or to support your cause. For more information about starting a fund, contact Joe Finneran at (614) 800-7985 or . Why would I choose The Stewardship Foundation to handle my donor advised fund? We are devoted to helping you make effective and meaningful grants that support organizations that promote life, protect religious freedoms, help support family values, educational enrichment, and social and moral concerns. It’s our purpose to encourage financial stewardship by educating our clients on gift planning to help fund current and ongoing needs of nonprofit organizations in line with our principles. Creating a Donor Advised Fund through Stewardship Foundation is free of charge and quite simple to do. You may claim a charitable deduction for the full amount of outright gifts in the year of each contribution, and make additional contributions in any amount at any time. What is the minimum amount required to open a fund? There is a minimum $5,000 to open a Donor Advised Fund. However, there are exceptions. If you want to consider a DAF, call us at (614) 800-7985 so we can explain your options. Who can contribute to my Fund? You or anyone else may make a charitable gift of any amount to any existing fund. All contributions are tax-deductible charitable gifts. How can I use my Donor Advised Fund? Throughout your life, or until you close the fund, you may recommend distributions from your chosen charities. You also may designate your spouse, your child, or other designate to your fund. Do I need cash to open a fund? Funds are started with many types of assets including cash, publicly traded securities, close held and restricted stock, real estate, and life insurance policies. We can advise you and help you open your fund using other than cash. Max and Anna Wolman were neighbors of Maxine Owens, a recently widowed military wife raising 4 children between 3 and 14 years old. The youngest daughter, Ellie, was born severely handicapped and that added to Maxine’s financial burden. In the middle of the night, the Wolman’s were awakened by the sound of sirens and the smell of smoke. 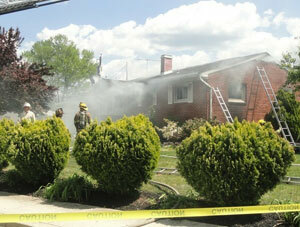 Outside, they found Maxine and her children safe on the lawn, but the house couldn’t be saved. The Owen’s lost everything they owned. Max and Anna invited the Owens family to stay with them in their house until the Red Cross could find them temporary housing. Within hours after the fire, neighbors began collecting clothing and other items for the family. The story was carried in the local newspaper and created a social networking buzz. Dozens of families offered to donate material goods and cash to help the Owens family rebuild. The Wolman’s garage was overflowing and their banker suggested that a fund be started to handle the cash donations. The Stewardship Foundation created the Owens Family Fund. Everyone who donated cash through the Fund received a charitable deduction for the year in which the funds were contributed. Within 8 months, because of the care and assistance of a caring community, and the proper handling of the donations, the Fund had enough, along with the insurance payment, to rebuild the Owen’s home. The Owens Family Fund continues today as a source of funds for the education and treatment needed for little Ellie.